March 21, 2014 by Beau H.
As the weather warms up, spring brings with it all sorts of opportunities for cool experimentation with colors. With brighter sunshine and (eventually) flowers in bloom, spring’s the perfect time to bust out some alternative styles and try on a different color or two. Although underrated and often overlooked, small pops of color can be a perfect, refreshing accent to an ensemble. And given that guys don’t often get many chances to show off flashy accessories, something like a watch strap can often be the perfect complement to an outfit. NATO straps have military roots (highly functional), but are now a welcome and widely accepted fashion upgrade.Whereas bracelets and rings are often too much when piled on with each other, a simple change of watch strap is an understated style move that can often feel like putting on a whole new watch. Canvas straps also seem more appropriate for spring and summer given the sportier feel and the ability to swap out straps so easily (especially on something standard, like a Timex Weekender). 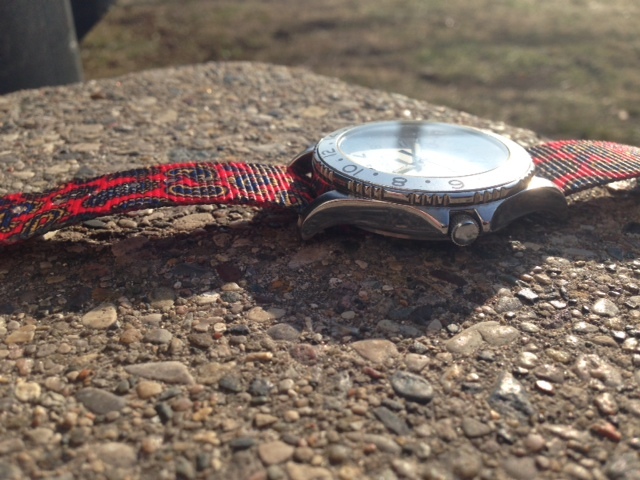 Use a watch strap to inject some color into a look on sunny days. That’s why it’s so great to see what The Knottery has done with their latest round of watch straps, all of which are priced below $20 (a big bonus, especially if you’re looking to cut costs). Released near the end of last year, the canvas straps have plenty of refreshing, bright looks perfect for spring — or any time color needs to be injected into your wardrobe. Picked up recently from the company’s online site, the patterned paisley watch strap certainly fits all the criteria of a refreshing spring style change. The strap itself feels sturdy and somewhat stiff, and could actually use some breaking-in time. It’s just long enough for my wrist, and doesn’t run too long. The mix of colors also means it can go with a white or black-dial watch. 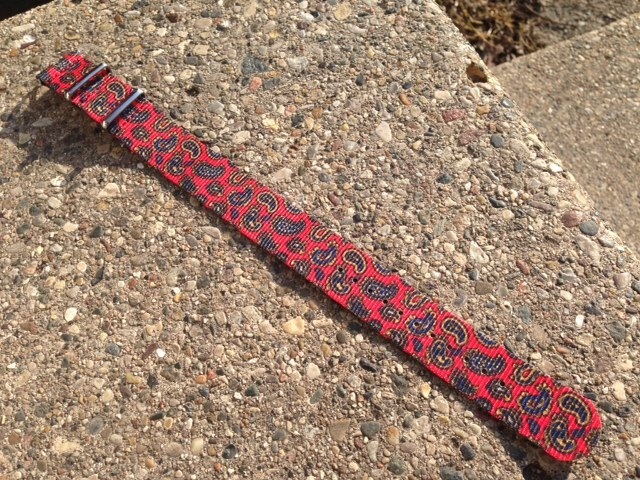 The Knottery’s patterned paisley watch strap. Watch by Timex Ameritus. The pattern when seen up close is quite eye-catching when contrasted with a crisp dial. It can also serve as a standout piece on its own when worn with other neutral colors. 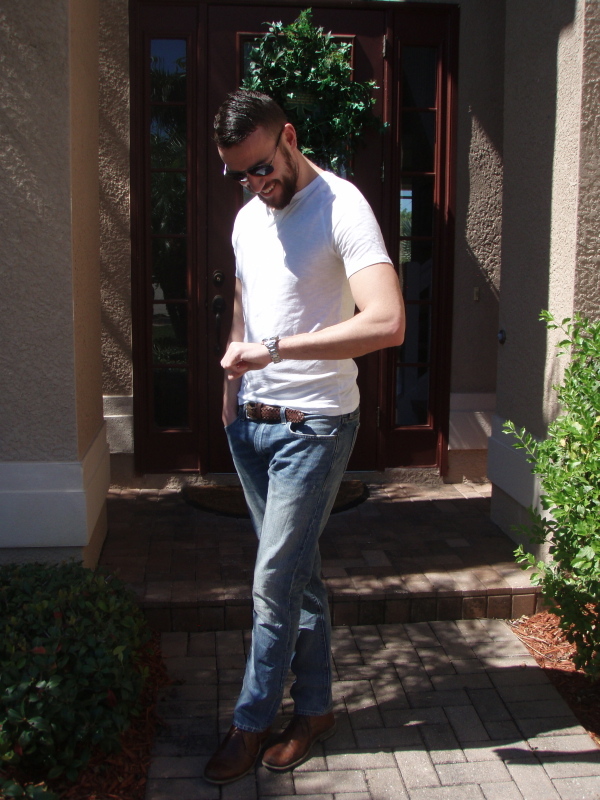 I took the watch strap for a spin earlier this week with a white henley, grey cardigan and lightwash jeans — all fairly color-neutral pieces. The watch provided just enough of a pop against a neutral palette, and actually served as a cool conversation piece, too. See the result for yourself here. 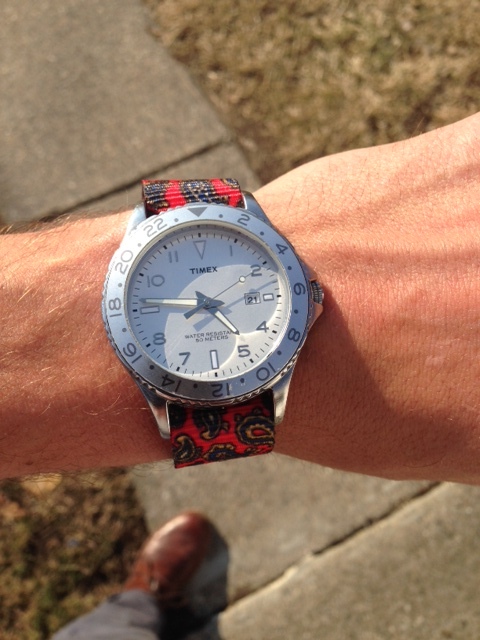 The full patterned paisley NATO watch strap. The rest of The Knottery’s line is just as unique as the paisley strap — some smaller pindot and plaid offerings, along with a more intricate flower pattern strap. When worn with the right color combinations (could be useful to keep some of these ideas in mind), the strap could be one of the more vital or interesting pieces of an outfit — just be sure to wear it in the right situations. It seems like these straps are more useful for providing some contrast in a neutral-colored, casual outfit, versus rocking it on the red carpet. But with a lighter-weight blazer and some jeans, a casual (yet patterned) watch strap could actually inject a nice dose of cool to your ensemble. Keep this style move in mind for the spring. March 8, 2014 by Beau H.
There are certain pairs of shoes out there that are timeless classics, avoiding the cycles of fashion and pairing with numerous outfits no matter the year. These types of shoes are near-legendary in most #menswear circles — they’re ubiquitous but never seem to reach a peak oversaturation point. Think Clarks desert boots in beeswax, or a sturdy pair of Wolverine 1K boots or a slick, sharp pair of captoe dress shoes in black or brown. Heck, even L.L. Bean’s slightly polarizing (but wildly effective) Duck boots have gained a cult following of sorts. That’s not to mention things like the Sperry Top-sider boat shoe or a low-cut pair of Jack Purcells or Chuck Taylors in the sneaker market. As if they weren’t already on that list, don’t overlook the inimitable, one-of-a-kind Weejun Loafers from G.H. Bass. 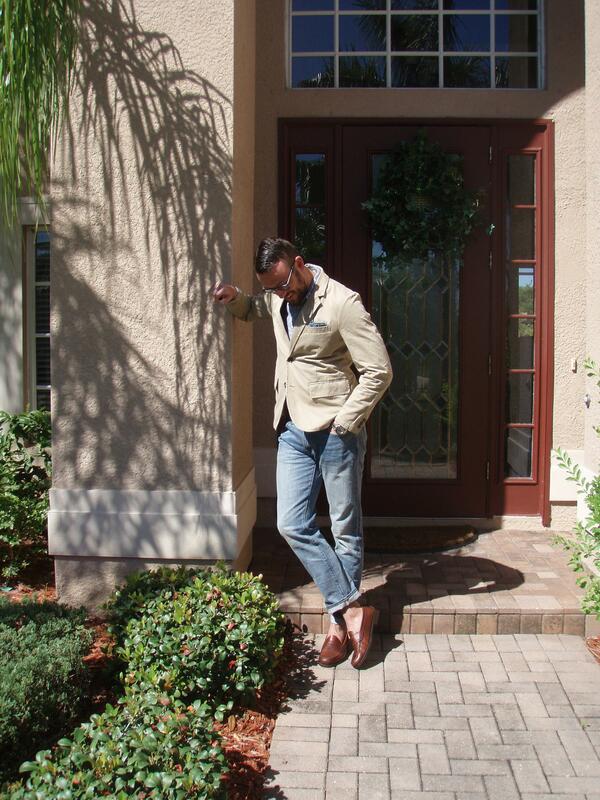 Bass loafers worn in a spring sharp-casual outfit. Jeans by J. Crew. Blazer by Gap. Watch by Invicta. Glasses by Burberry. Shirt by CPO Provisions – Urban Outfitters. Introduced to the world as an updated, fun take on a Norwegian farm shoe in the late 1930’s, the Weejun has since become a style staple across the country for combining that perfect mix of casual and prep. Also known as the “penny loafer”, it certainly has its fair share of sharp (and not-so-sharp) East Coast-type style attached to it. But it’s surprisingly versatile and wearable in a number of situations. And, the company now offers shoe care products, Oxford dress shoes in a pleasantly light array of colors and driving loafers and moccasins, among others. On a personal note, I’d always found loafers a tough shoe to pull off. They required the right setting, the right outfit and most importantly, the right weather. Given a recent trip to Florida and the oncoming signs of spring, the timing was just right to try out a pair for the first time. The shoes are well-made and the quality doesn’t drop even when on-sale from a Bass outlet. The leather feels relatively sturdy and smooth, and when paired with a brown leather care product, it seems as if these shoes could last a long time. A size 10 1/2 (a 1/2 size up than normal) isn’t terribly loose, either. More importantly, like any other great pair of brown shoes, they seem to have loads of versatility. And they exist in the perfect realm between a canvas sneaker (better than running kicks, but too casual) and flip-flops (which should ideally only be worn for guys by the water or at the pool). Given spring’s approaching weather, taking a sharp brown loafer out for a spin with a pair of lightwash denim, as shown above, is a more unique style move than sticking with dark denim or chinos, although both of these certainly could be done as well. The slick leather offsets the more casual, relaxed nature of both the light and the dark denim, so those combos could work interchangeably. The washed khaki chino blazer from Gap (picked up in an outlet store) as pictured is relatively slim off-the-rack, unstructured and easily wearable with a simple printed button-down (something like this Urban Outfitters number could do the trick). Keeping vacation time this spring with Bass Weejun loafers. Pocket square by J. Crew. Of course, the right pair of slim chinos (feel free to work in some color here, too) would work outstanding here, as well. On the top half of your outfit with these loafers, the possibilities are pretty endless. Because lightwash or dark denim provides a sort of hi-lo contrast with a leather loafer, everything from a white henley to that patterned shirt and khaki blazer combo would work (as seen above). Polos (and perhaps a popover as an alternative) are surefire bets as well — work in some color too! And, as many of us have surely seen, the Weejun loafer doesn’t look one bit out of a place dressed up with shorts. As with any of these outfits though, when it gets noticeably warm, outside, be sure to ditch those socks. Some are partial to wearing a loafer with socks in the colder months, but that combo seems counterproductive when it’s snowing heavily. When going barefoot in the warmer months, if you prefer alternatives other than foot powder, no-show sock alternatives are discussed in great detail here by Barron at Effortless Gent). Experimenting with Weejun loafers and shorts. Navy polo by J. Crew. Shorts by J. Crew Stanton. Belt by Target Merona. Glasses by Burberry. Note that the proper pair of shorts should hit above the knee and lean slim, not baggy (ditch those cargo shorts at home, preferably). 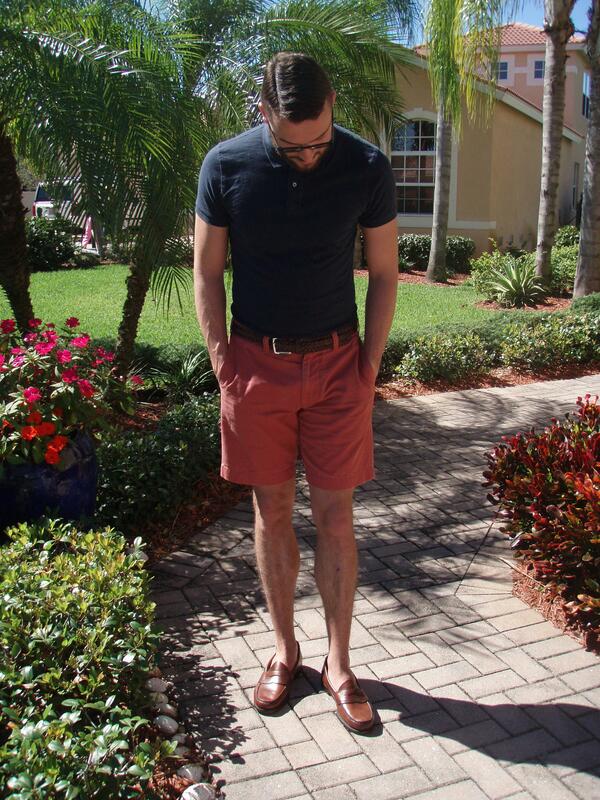 And the right pair of shorts in the spring and summer ideally have a pop of color (note the red in the photo). Tremendous above-the-knee, well-fitting shorts can be found at nice prices by the bunches over at Land’s End Canvas (look for something with a 7-9″ inseam, perhaps the Comer Chino or Chambray options). J. Crew’s Stanton short is well-deserving of praise, (as pictured above). And it seems like even Old Navy is offering a slim-fit short in a variety of colors with an inseam just past 9″. Because the brown loafers are relatively minimal, they provide lots of room for experimentation with colors. And if you feel so inclined, that polo or popover shirt could certainly be tucked in (based on how it fits and feels — that look is too preppy for some; not that there’s anything wrong with that!). Even in warmer weather, one pair of shoes can take you a lot of different places when combined with more unique items like lightwash denim or a spring or summer blazer. Of course, a staple as classic as Weejuns (which have barely changed across the decades) pairs perfectly with other timeless essentials, like polos, slim shorts and slim jeans in a variety of washes. When the weather does warm up in your neck of the woods, Weejuns could (and should) become a go-to spring and summer shoe. March 1, 2014 March 2, 2014 by Beau H.
Now that it’s officially March on our collective #menswear calendars, it’s high time to at least start thinking about spring (if you haven’t already been following trends and early pieces of collections). While runway looks can, of course, get a little dicey to follow at times, there are some pretty simple spring-ready looks the rest of us can take on to freshen up our wardrobes and inject a sense of warmer-weather style into outfits. 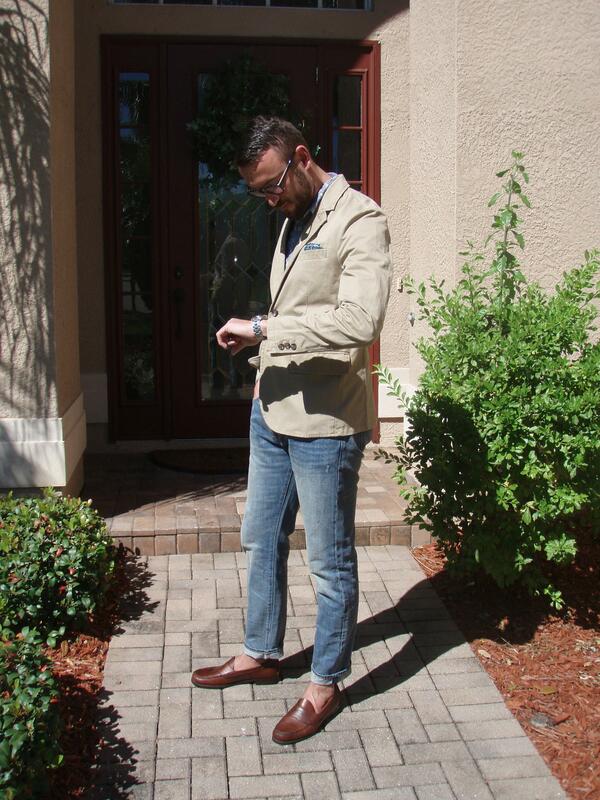 Lightwash denim in the Florida sun. Jeans by J. Crew (484 fit). Henley by Mossimo. Desert boots by Steve Madden. Sunglasses by Ralph Lauren. Case in point — this can be done fairly easily below the waist. Although classic, slim dark denim gets a lot of play on this site and many others (here’s an Effortless Gent post on the topic by yours truly), warmer months call for a change (most of the time) in what we wear on our legs. That’s not to say that a pair of crisp blue denim won’t work across all seasons — because it certainly will — but spring and summer can be an ideal time to shake up the denim spectrum. This can be done in a few different ways, but reaching for a slimmer pair of lightwash jeans is a great way to get the ball rolling. The key here, as with all denim, is to look for a pair that fits well, not baggy (on a personal note, J. Crew’s 484 jean as pictured above fits almost exactly like a slim-straight jean from Levi’s). And keep in mind these aren’t the stonewashed varieties of years past — with a lower rise and slimmer, edgier fit, they’re entirely modern. Lightwash jeans work perfectly in the sunnier months of the year simply because their color, fit and feel are light, airy and relaxed — all the ideal trends and feelings of the warmer parts of the year. Whereas inky black denim and a sharp pair of black boots could become standard uniform in the severe cold of Michigan, a nicer pair of lighter-wash jeans practically scream spring and summer fun once it warms up. On vacation time. Watch by Invicta Pro Diver. And just because dark denim is practically the king of versatility among anything outside a suit doesn’t mean lightwash denim can’t be worn in just as many ways. Eschewing many of the top-heavy layers of winter, however, is the first step to making these jeans work for you. Several stores sell nice variations on the piece, from J. Crew (as pictured above) to a slightly slouchier fit by Gap to a straight-fit lighter wash by Old Navy. Another place that’s certainly worth checking out both for price point and versatility of looks is 20jeans. An addition to the market earlier last year, the company has jeans available in slim, skinny and straight fits. They’re also offering about three or four skinny and slim washes of light denim for $35, definitely a great price point for most us. Without personal experience, it’s tough to note quality, but others have told me very good things. As always, be sure to peruse the digital (or brick-and-mortar) shelves of Levi’s for a nice pair of 511’s or 513’s at a nice, low price if you’re so inclined. Putting together outfits with light denim is inherently less complicated than dressing for the fall and winter, too. That’s because the first step (starting with a base denim) isn’t followed with piling on four different top layers to brave the Midwestern chill. 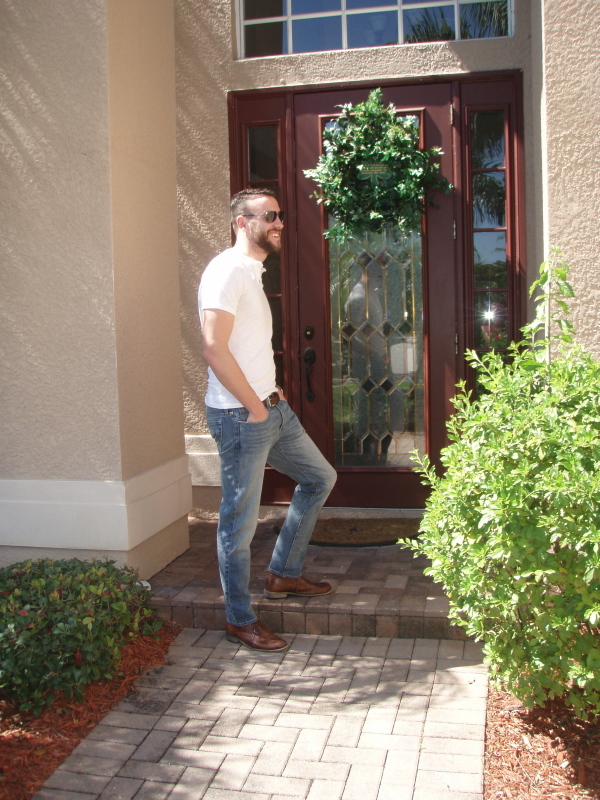 Because lightwash jeans exude a more casual, lived-in vibe, simple things like a white henley (as seen above) or a crewneck t-shirt can work for running errands or even hopping down the hallway to a class. A mean-cut pair of desert boots (like the Steve Madden boots shown above) anchor the outfit in a more rugged way than a simple pair of sneakers might — however, some slim canvas kicks work well too, as we also see below. It’s important to note, too, that accessories will go a long way in making the outfit summer-appropriate. Siblings With Style will have more on sunglasses later, but in the interim, look for a crisp, classic, relatively inexpensive pair of aviators (like the ones above from Ralph Lauren) or some Wayfarers (another relatively fail-safe classic that’s also decidedly on-trend). Because of the casual nature of many of these outfits, many types of watches will work, everything from a canvas Timex Weekender to a sleeker, decently priced dive watch. A slightly more unique take on light denim. Floral shirt by Express. Jeans by J. Crew. (484 fit). Canvas sneakers by Urban Outfitters. 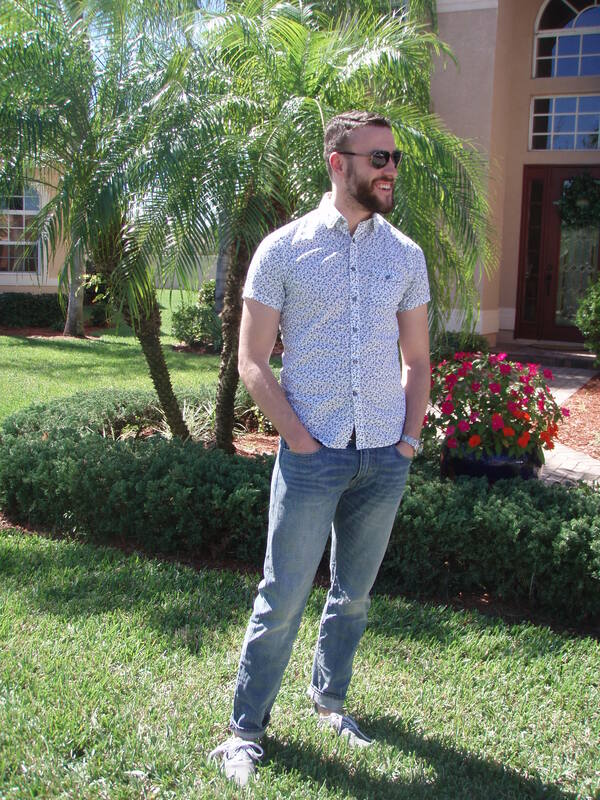 And when the situation calls for something slightly more dressier, lightwash jeans work just as well with a collared shirt while leaving wiggle-room for experimentation Some are against short-sleeve shirts, but there are a few keys to follow. These short sleeve shirts (a variation of which is worn above) aren’t the ill-fitting Hawaiian prints of days gone by. 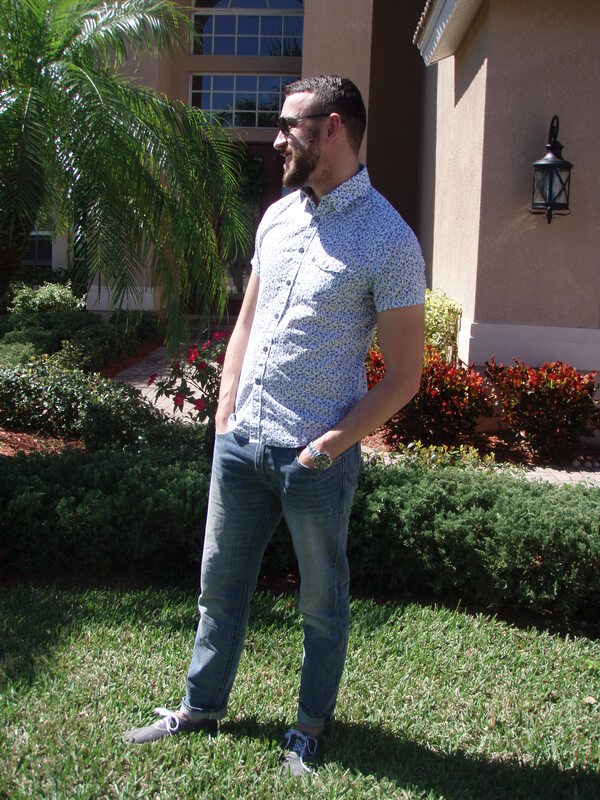 Short sleeve shirts now have leaner, meaner fits and more eye-catching patterns (the brand The Critical Slide Society sells some eye-catching short-sleeve shirts with patterns through online retailer ASOS). In the outfit pictured above, a less obvious version of hi-lo styling comes into play with the canvas sneakers and slightly cuffed jeans. Another alternative revolves around the popover shirt, a retro classic that’s making another well-deserved turn (in both short-sleeve and long-sleeve variations) in the spotlight. The best seem to be sold at J. Crew right now in a variety of soft washes and stripes for summer. Consider it a more eye-catching update to the polo, and don’t think twice about wearing it with lightwash jeans. Now, dressing up lightwash denim is a little more difficult, especially since it’s worn primarily casually to begin with, but it can be done (look at the photo under the ‘Adopt A Personal Uniform’ section for how to do up some distressed denim here) The key with trying to spruce up lightwash jeans would be to start with smaller pieces in combos (like a lighter-weight striped sweater or long-sleeve shirt over an OCBD) and then move on to bigger pieces like v-neck sweaters in appropriate colors. Use a dive watch and floral shirt to contrast with the more casual nature of the lightwash jeans and sneakers. Sunglasses by Ralph Lauren. Footwear is the cap on any outfit, especially one with lightwash denim. A slick pair of desert boots could work with a more casual henley or crewneck tee, whereas a slim, low-profile pair of canvas kicks could create a hi-lo vibe between a popover or collared short-sleeve shirt. The same follows vice versa, too. This pair of sneakers from Urban Outfitters, while inexpensive, could be perfect for kicking around town with a pair of slightly cuffed lightwash jeans. And because it’s going to be spring (followed by summer), leave the darker denim, heavier layers and socks at home, at least for a while. One pair of good lightwash jeans could work wonders for injecting some fresh spring and summer style into your wardrobe.